December was one big excuse for calories. By the week of Christmas, I couldn’t handle making another elaborate recipe but alas, my last cookie exchange of the season was looming. I was inspired by the delicious local favors served at my friend’s recent Ohio wedding, buckeyes, and decided to recreate them as an alternative to my standard desserts. The recipe was beyond easy and required no grocery runs for complicated ingredients, which pretty much sealed the deal for me. 1. Line cookie sheet with wax or parchment paper; set aside. 2. In a large bowl, stir together the peanut butter, softened butter, vanilla extract, and salt with a wooden spoon. Add the powdered sugar a little bit at a time, stirring it into the peanut butter mixture until it is completely incorporated. 3. Roll the peanut butter mixture into 1-inch balls. Set them on the prepared cookie sheet and insert a toothpick into the top of each ball. Chill in freezer until hard, approximately 30 minutes. 5. Using the toothpick as a “handle”, dip the peanut butter balls into the chocolate, leaving a small circle exposed on the top of each ball. I also went sort of crazy and splattered the chocolate everywhere since my dips didn’t turn out so great. 6. Place the balls back on the cookie sheet and refrigerate until the chocolate is set, approximately 2 hours. 7. Once the buckeyes are set, remove the toothpicks and if you’d like, you can use your finger to smudge the peanut butter dough together on the top of the buckeye to cover the hole where the toothpicks were. 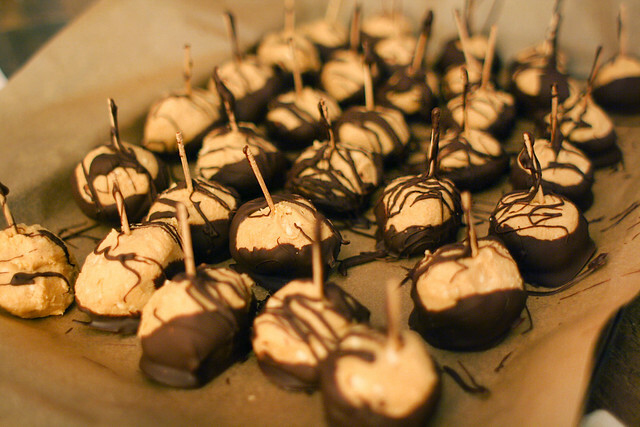 Store the buckeyes in an airtight container with wax paper between layers in the refrigerator for up to 1 month.